All white flowers bouquet which includes white Casablanca, white Roses and white Gerberas together with white fillers and mixed greenery similar to Ruscus, Fern, and Monstera, this is a unique way to send flowers to Malta and Gozo. 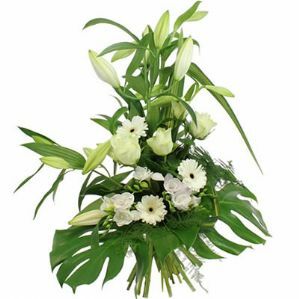 Order this flowers before noon and you can get them delivered today ! Yes we do same day delivery to Malta and Gozo, if order received before noon.